"'Winter on Fire: Ukraine’s Fight for Freedom' does an adequate job of telling the story of a people’s revolution from the people’s point of view, but as a documentary it could have done more to relate the events and their importance to an outsider." 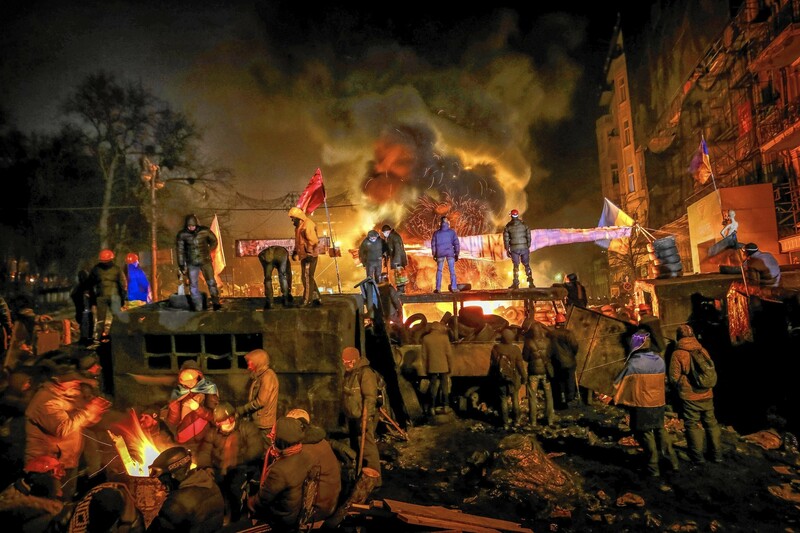 Winter on Fire: Ukraine’s Fight for Freedom’s attention to detail has garnered it an Oscar nomination. While it boasts an enormous amount of footage from the conflict that erupted between protesters and the police, it ignores or omits the repercussions and geopolitical narrative of these disturbing events. The story of the protesters forming a ragtag army and defending their position against the odds for months is an engrossing tale, but the narrative is unfocused, with no narrator or experts dispassionately leading the viewer through the events and putting things into a global perspective. Ukraine’s protesters, looking more like a platoon than citizens. The focus is entirely on the 93 days of protest that led to President Viktor Yanukovych seeking asylum in Russia, while only dealing with the annexation of Crimea from Ukraine in the footnotes at the end. Winter on Fire might just be an example of a poor title; some might expect the narrative to cover the rest of the winter and even the larger perspective. As dates flash on the screen and the protest turns into a battle, it might have helped to mention things like those little Sochi Olympic games going on not very far away, which would have helped remind the viewer why they might not have heard much about the massive events that rocked Kiev and Ukraine. The media was too busy swooning over sports for the average person to hear much about battles being fought in a democratic country. While the emotional impact of watching the protesters hunker down and form a mostly unarmed army against the police is inspiring and engaging, it can create a confusing narrative. The only real intervention by the filmmakers is an occasional map or date; the people featured describe events emotionally rather trying to tell people what is going on, what tactics are being used. There are a few interviews from after the fact mixed in, but they are all with former protesters. There are no interviews with any of the police on what they were thinking when firing live rounds into unarmed groups of people, or any of the media interviews that must have taken place with the beleaguered President Yanukovych or other politicians, resulting in an uneven finished product. Now, I’m not one those fools that thinks there are two sides to the story of tyranny vs. freedom, but getting the perspective of all involved is important for any documentary. Winter on Fire: Ukraine’s Fight for Freedom does an adequate job of telling the story of a people’s revolution from the people’s point of view, but as a documentary it could have done more to relate the events and their importance to an outsider. We can all rally behind the cause of freedom over tyranny, but with little in the way of explanation or context, the intense focus on the protesters hurts what could have been a truly astounding film. Mohawk College graduate in Journalism. Movieaholic with an insatiable thirst for those elusive good science fiction movies. If I can get my lazy bones off the couch, it's to go skiing.